Reading the first edition of Code Complete, over a dozen years ago, was a refreshing experience: here is a writer that does not attempt to teach “programming in 21 days”, but rather how to write programs that can be maintained for more than 21 days. The advice was wise, and relevant for most programming languages. 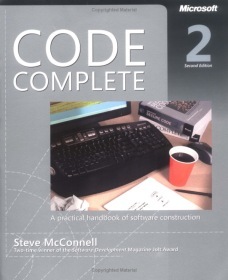 I’ve recently joined Google, and one of the books found on every programmer’s desk here is Code Complete’s 2nd edition. I could not help but wonder how does the update measure up --- when read with the eyes of a more experienced software engineer, and compared to the legendary status achieved by the original? The book still contains the same kind of solid, well-thought-out advice. I still believe that most novice programmers will benefit immensely from reading it. However, at the same time, I was somewhat disappointed by several shortcomings, and in particular McConnell’s disregard for language-specific issues. The key philosophy of Code Complete is that good programs share certain traits, no matter what programming language is used. Information hiding, defensive programming, clear design, good naming conventions and so forth are all extremely relevant, regardless of the language. This is generally true. However, when language-specific issues are discussed, the book falls short, and the book greatly underplays the importance of the language used in those places where it does matter. Not only Java suffers: the same goes for C#, which is discussed only briefly. For example, the discussion of multidimensional arrays (p.625-6) ignores C#’s support for matrices, as opposed to “jagged” multidimensional arrays (arrays-of-arrays). Using McConnell’s advise here will result in code that is significantly less readable, yet provides only a fraction of the promised performance benefit (or maybe no benefit at all). This is a classic example of where language-specific features do matter. But not only language-specifics are lacking in this book. Recursion is presented as an “unusual” control structure, and the concept of tail recursion and its effect on performance is ignored. Mixins are explained nicely as “simple classes that are used to add a set of properties to an object” using multiple inheritance (p.149), but the explanation pays no regard to the fact that the term “mixins” is also used for a generic classes that extend their generic argument. But this is nothing compared to the fact that there’s simply no discussion of generic programming, including C++ templates; a glaring omission. The discussion of defensive programming (Chapter 8) never mentions defensive copies (see, for example, Item 24 in Effective Java). And the list goes on. I think the mistake that bothered me most was the confusion of global data (p.335--343) with public class members. The discussion of global data in the first edition was precise and relevant; here, when moving to the world of object-oriented programming, McConnell botched things completely. Global variables are discussed on the same ground with public data members, even though each has a completely different set of issues, benefits and shortcomings; for example, public data members, unless they are also static, do not normally suffer from multithreading issues. And access routines, while they solve the problem of public members, are certainly not a solution for global variables. Conversely, the fact that static class members are actually global data is never mentioned. To summarize: yes, the book is still a recommended reading, mainly because it presents well-thought-out reasoning for forging well-written code. I will still advise novice programmers to read it. But its many factual errors and confusions, and the overly broad attempt to be relevant to all programming languages, diminish its value noticeably. Perhaps Steve McConnell and everyone else is unable to comprehend all of the growing universe of programming languages and related phenomena? When the first edition of this book was published I found the expressed viewpoint not comprehensive, but still very valuable. Even then, the author did not appear to understand everything significant about programming languages, but the author did seem to understand most of the significant stuff. As the area has grown more and more complex and especially varied, the author seems to be speaking more and more from one very useful, but narrow perspective. Beyond the criticisms the reviewer mentions, the author in the second edition seems not to understand dynamically typed languages very well. The ''programming language universe'' has certainly not grown too large in this sense. And even if it had, in a book that deals with a mere handful of languages, one would expect the author to be familiar in greater detail with the languages he writes about. I wouldn't have had any complaints about lack of familiarity with Java, for example, had the author not attempted to provide specific advice to Java programmers.